Since November 2017, visitors to Brooklands, the birthplace of British motorsport and aviation, have been able to enter a restored Second World War hangar and experience what it would have been like to work inside an aircraft factory. The aircraft factory exhibition was part of the larger HLF-funded £8.4m Brooklands Aircraft Factory and Race Track Revival project to restore the relocatable Bellman Hangar and move it from its location on the finishing straight of the racetrack, restore the track for events and also build a Flight Shed where aeroplanes could be wheeled out onto the track for demonstrations. Planning for the project began in 2007 and it was decided early on that the aircraft factory exhibition inside the Bellman Hangar would be designed to connect visitors to the site’s extraordinary history and people with an immersive approach to the displaying and interpretation of objects in the collection. The Bellman Hangar was one of many designed by Norman Bellman in the late ‘30s to provide the RAF with a relocatable structure that they could presumably move across Europe. Brooklands’ own Bellman hangar was erected in November 1940 and in the height of the Battle of Britain, the RAF’s most important fighter, the Hawker Hurricane was built there. Over the 80 years up until its closure in 1989, there was an aircraft factory working on the site with more than 18,800 aeroplanes completed and flown out of Brooklands. At its peak Brooklands employed 14,000 workers. 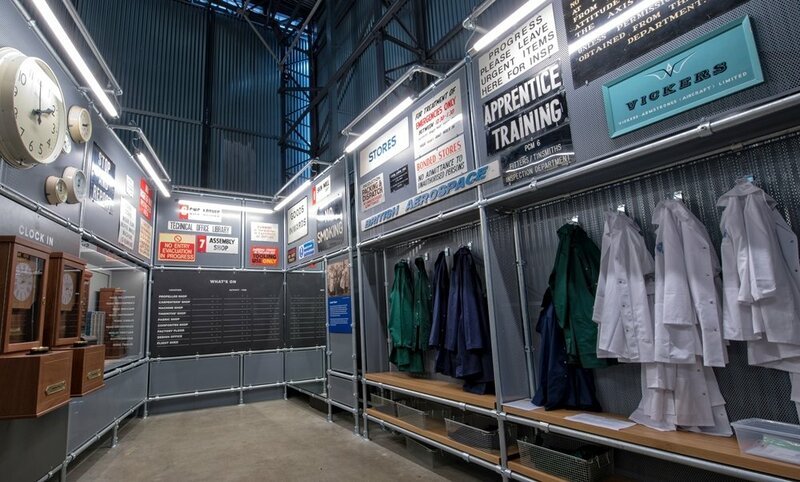 Now visitors get to experience the different processes those workers would have completed in order to build the aeroplanes needed for the war effort, for example, in a mock-up factory. 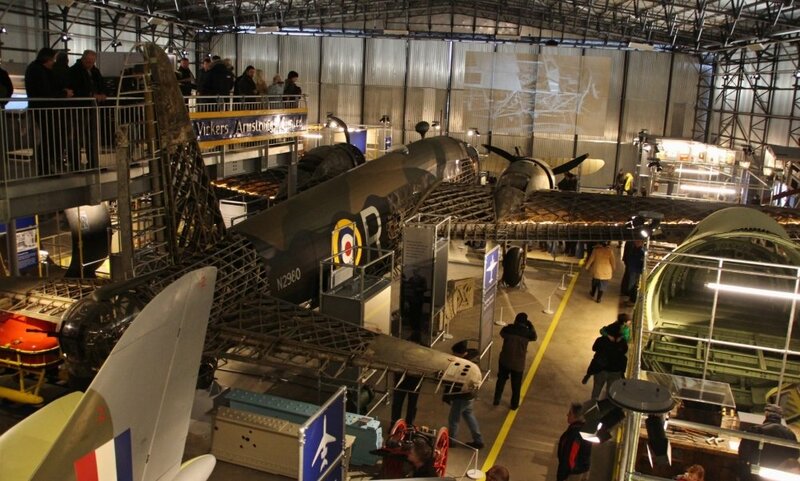 Now that has all being changed and on the ground floor of the hangar, which is referred to as the shop floor, is a central production line running diagonally through the building with various departments that would have made the aircraft on display around them such as a Wellington Bomber. The Wellington was rescued from the bottom of Loch Ness in 1985 and restored by some of the museum’s 800 volunteers, many of whom had careers Brooklands. 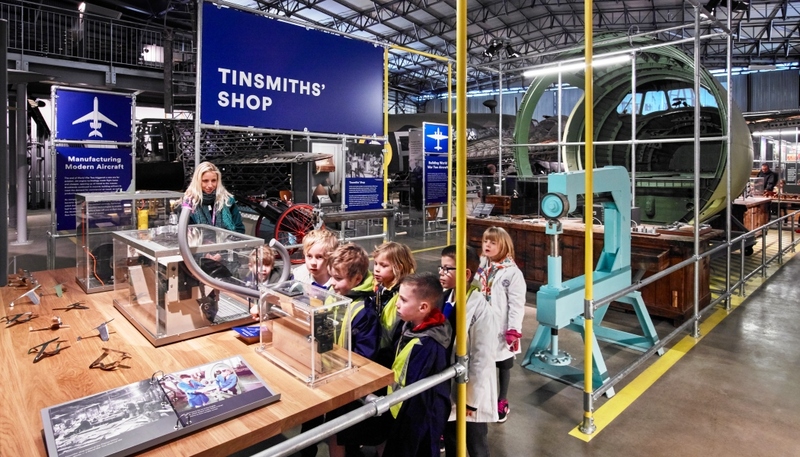 The exhibition now connects the visitors to the manufacturing of aircraft that actually happened on the site and also encourages them to understand and empathise with the workers and their incredible feats by having a go at the hands-on elements. To accomplish that industrial environment, the design of the hangar floor was set out as an industrial setting with production lines created with industrial floor markings. In the centre is the assembly line where all the different parts of the aircraft come together to form the final completed unit. Surrounding the assembly line are independent lines that demonstrate the various elements that make up an aircraft such as the wings, fuselages and engines. So, it breaks the aircraft down into components. And within those sections it is broken down further into shops, which are independent departments that demonstrate different processes. There is a carpenter’s shop, which demonstrates the wood-making elements so important in early 20th century planes, a tinsmith’s department, which talks about making things out of sheet metal, a fabric department also important throughout the last century, a propeller shop, which demonstrates how propellers were carved, a machine shop, which shows how workers would have machined metal from solid and a composites shop to bring the production processes up to the modern day. Within those shops there are two different sections, one is historic benches that were actually used at the aircraft factory to build aeroplanes that now display original objects from the Brooklands collection. And the second, on the opposite side, is a newer modern-built bench, which contains interactives. In this case every interactive on the ground floor of the hangar is hands-on and mechanical – there isn’t a single touch screen among them. When visitors arrive they can collect a clocking-in card and work coat and clock into their shift on the factory floor and as they go round each of the shops they gain a stamp on their card, which mirrors the experience of apprentices. Throughout, visitors will see the duality of both history and a slightly more modern edge, says Lewis, with all the structures in the hangar floor for instance being made out of scaffolding tube, which gives it a real industrial feel but also looks very fresh and modern in terms of design. There are lots of exhibition displays between the shops and people can wonder around the aircraft into the shops as there is no set route. There is also a soundscape with factory noises, which further creates that working environment. As well as the shop floor there is a design office in a specially built mezzanine floor. The design office talks specifically about designing aircraft. This is where the touchscreens come in, which Lewis says are the most effective way of having interactives that tell people about the different decisions designers have to make when designing an aeroplane. 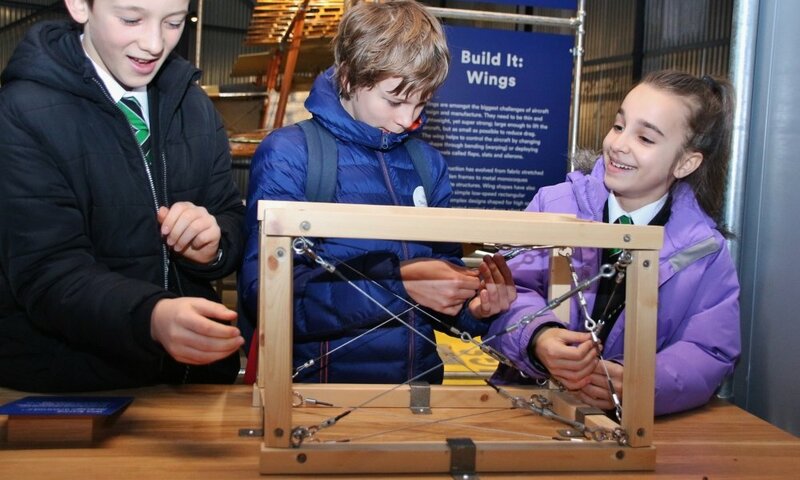 These include multi-choice games where people can attempt to design Concorde or a 1950s airliner and there are challenges to complete where visitors are asked to choose different aircraft components to put together and achieve the ideal result. 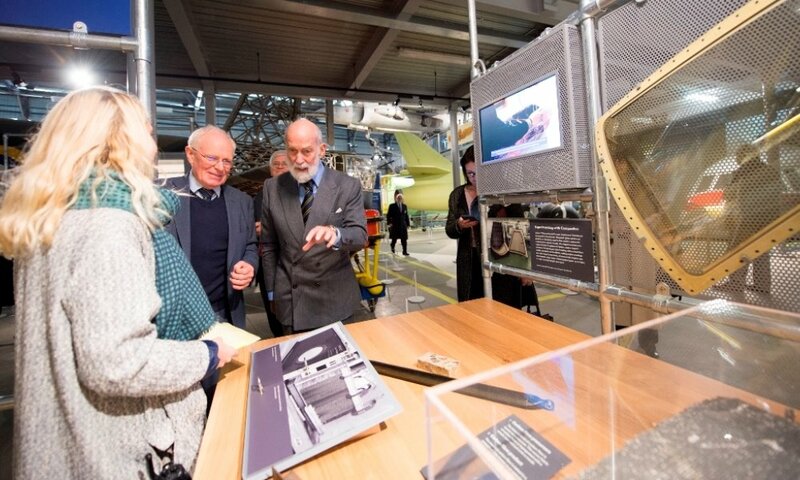 The aircraft factory exhibition is complemented by a new purpose-built Flight Shed, which has exhibition space upstairs and on the ground floor a workshop where Brooklands runs courses to teach people about aviation skills to maintain historic aircraft. This training is initially catered to its own volunteers to conserve the collections better, but eventually it will be expanded to inspire the next generation of engineers and even to help other museums conserve their aeroplanes. 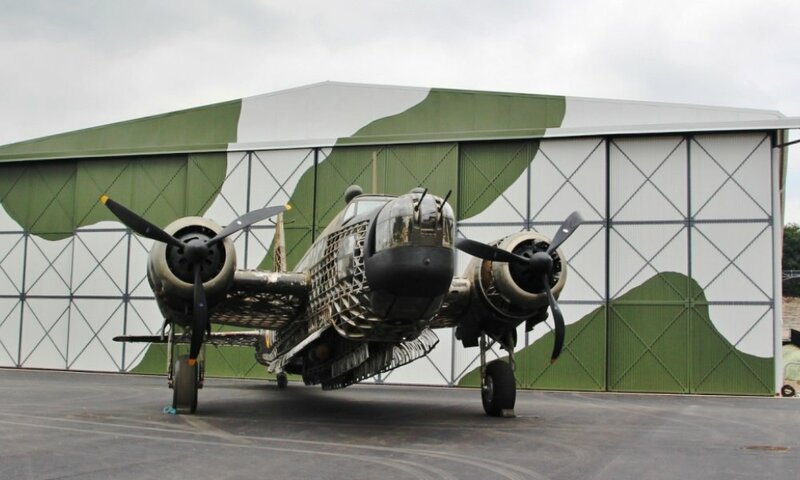 Visitor figures have increased 15 per cent over previous periods since the Aircraft Factory and Flight Shed opened and in 2017 the museum welcomed a record 186,459 visitors. Over the next five years the museum hopes to increase that to 250,000. The exhibition cost £1.319m and was made possible through a £5.5m HLF grant as well as funds from Art Council England, Surrey County Council, LIBOR banking fines, charitable trusts, foundations and individuals. This project has been shortlisted in the Permanent Exhibition category at the Museums + Heritage Awards for Excellence, with the winners being announced at a ceremony on 16 May.